The Queen once said she had had an "annus horribilis", a horrible year - a reference to the very public failure of several of her children's marriages. 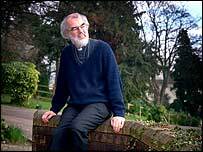 It will be no wonder if the Archbishop of Canterbury, Rowan Williams, feels exactly the same as 2003 nears its end. For him, though, it is the plight not of a child that saddens him, but the collapse of the church he now leads. 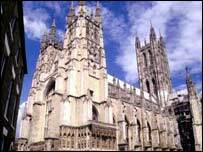 After 450 years of unity, this is the year that will mark the inescapable end of the worldwide Anglican Communion. The collapse has already begun: Anglicans in south-east Asia have announced their intention to sever links with the US branch of the church, Ecusa (Episcopal Church in the USA). The year had begun promisingly with the enthronement as archbishop of Canterbury of Dr Williams. He was welcomed by many in the Church of England, Anglicanism's parent church, and by many more in the 70-million-strong Anglican Communion, a loose federation of 38 autonomous churches bound by tradition and (to some extent) by doctrine. Those who applauded Dr Williams' appointment hailed his thoughtful liberalism, not least on sexuality. Those who thought him too liberal by half on homosexuality were very doubtful that he was the man to lead the communion. Dr Williams' archiepiscopal honeymoon was shortlived. 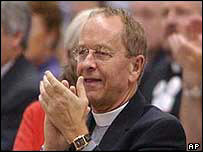 In June the church of England was embroiled in a row over the nomination as bishop of Reading of a gay man, Canon Jeffrey John. The row fizzled out when Canon John decided to stand down, though it left a sour residue of distrust. But that was only the curtain-raiser for the far bigger international battle over the nomination of another gay man, Gene Robinson, to be a bishop in the US church. On 16 October the archbishops (known as primates) of the communion's 38 separate provinces ended an emergency meeting in London, summoned by Dr Williams to discuss the growing crisis. "We have had to conclude that the future of the Communion itself will be put in jeopardy." Despite that, the consecration went ahead. On 2 November Canon Robinson became bishop of New Hampshire, and the unity of the Anglican Communion started unravelling. The church of England teaches that lay members can be practising lesbians or gays if they must, but clergy cannot. Despite that, many outstanding parish priests are homosexual, loved by their parishioners for who they are, irrespective of what they get up to in bed. So in one sense, this was a row that was bound to break out sooner or later, as church members found the split between doctrine and practice increasingly intolerable. The church did not really tackle it under the last Archbishop of Canterbury, George Carey, so it was inevitable that Rowan Williams would at some point have to act. The apparently inevitable consequence, with provinces going their own separate ways, is what every archbishop of Canterbury dreads. Disunity, for the church, is the ultimate failure. The way Dr Williams has acted has disappointed both camps. Those who think him too easygoing believe he is being borne helplessly along on a tide of liberalism, while many of his supporters say he is failing to stand up to (in their view) medieval bigotry. Both camps are sincere, and neither has a monopoly of the truth. But in those parts of the world where sexual definitions are increasingly irrelevant, a church which sets such store by them is left more and more with only itself to talk to, and nobody else remotely interested.